Another picturesque view during the stroll through Gimmelwald. Not quite sure right now, but either this or the next place was reported to be selling fresh eggs, milk and dairy products. In a similarly small, lush plot across the road, several goats were seen munching the rich grass and bleating once in a while. Very "Heidi" like. Love the complexity of the weathered wood, Ayush. Is this a barn conversion to living quarters, Ayush? Or Hansel and Gretl, Ayush? What a view out the back door! short but powerful summer Ayush; the plastic chair takes us to reality, good shot! What a lovely place Ayush. My only thought is I wonder how long a time they are snowbound in winter - months? Somebody once said that in Switzerland, everything is either illegal or compulsory. I recongnise this for your earlier posting with the rustic table and chairs - so much nicer than the green plastic thing! Those mountains are fabulous. So Swiss, Ayush. A beautiful shot in a beautiful country. Funny, when the picture opened, I thought "Heidi". Beautiful with the mountains looming. This is gorgeous. I can't imagine those mountains out my door. A stunning shot Ayush. Fantastic color. I still can't get over that lovely mountain background, and I see they have plenty of wood stacked away for the winter. How lucky they are to be situated in this majestic setting. Love the natural weathered look of the building. I think I would have be tempted, Ayush, to knock on the door and ask if they had Swiss cheese for sale just to get a peek inside. Another fantastic picture of a Swiss village. I am delighted that country. Here everything enchants. Lots to appreciate in this shot, Ayush. Love the texture of the wood, HDR ? It's a wonderful picture. 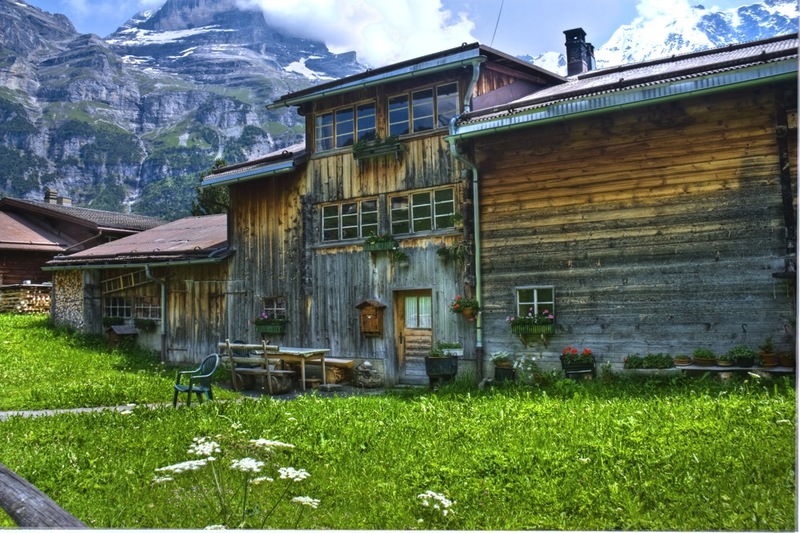 Such a lovely, green place, this old wooden house and/or stable and then the beautiful mountains in the background. Really good.